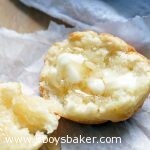 Soft, buttery and so tender these Sour Cream Biscuits have only 3 ingredients and they melt in your mouth. The perfect accompaniment to any meal. I learned a super important lesson the other day and that is to pay closer attention to emails. Apparently a couple weeks ago I received an email letting me know that my site’s server was being retired and I needed to migrate my site over to a new server by May 23rd.That date came and by the end of that day I had no access to my site. Oops, completely missed that email! Once we figured out what had happened, I called my extremely wise brother in a panic and he helped me get things switched over. There are still a few glitches on my site, so please bear with me. 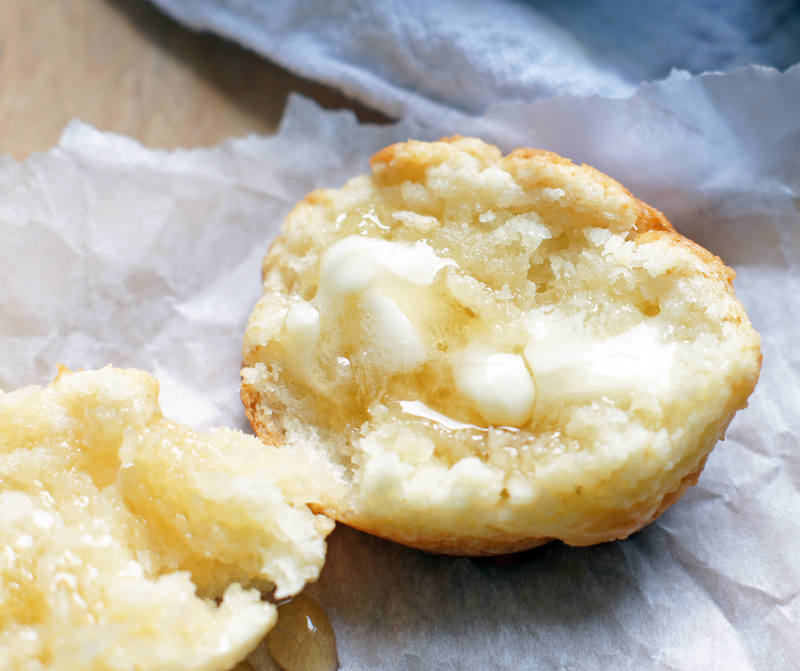 Now let’s talk about something a little more exciting and delicious, these amazing Sour Cream Biscuits. They require 3 simple ingredients (ok, 5 if you don’t have self-rising flour) and are the easiest things to make. If you hate making biscuits because of the rolling and cutting, there is none here. Just scoop and plop into your muffin tin. Easy peasy. My mom and dad raved about them the other night and told me I had to make them and that I’d want to eat the entire batch. They were so right. My mom got the recipe a few weeks ago from the newspaper. Let me tell you a little bit about these biscuits. They are extremely tender, buttery, soft and basically melt in your mouth. There really is no reason to spread more butter on them since there is a whole stick in them, but the more butter, the better is what I say. Go big or go home, right?! 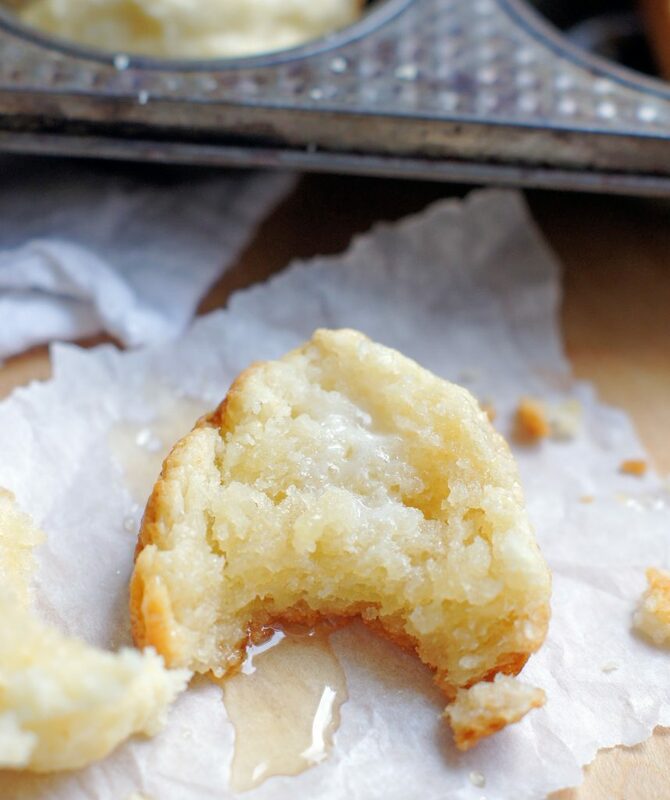 Then drizzle some honey on them (or jam) and you may want to marry them♡. The only thing I might consider doing differently is making 6 biscuits next time instead of 8 so they will be a little bigger. We happen to be biscuits lovers at our house and because these tiny little things are so stinking good, we agreed bigger would be even better! For those non-biscuit lovers out there, these will totally win you over! These are definitely going to be appearing weekly at our house. In a large bowl, whisk together the butter and sour cream. With a wooden spoon, add the flour and stir until well mixed. The dough will be thick and sticky. Divide and scoop into muffin tins. Bake at 400 degrees for about 20-22 minutes or until the biscuits are brown on top. Serve warm with butter and honey (or jam). If you don't have self-rising flour (which I never do) just add 1 1/2 teaspoons baking powder and 1/4 teaspoon salt per 1 cup of flour. When I saw the ingredients, I thought the ratio of dry to wet couldn’t be right – I was right….I wasted a stick of butter! I’m sorry these didn’t work out for you. You’re the first person to say these didn’t work out. If you read all the other comments, my readers love them and haven’t had any problems with them. Not sure why they didn’t work for you, but I’ve made them over and over and never had a problem with them. Did you make 6 or 8 biscuits ? do you think 22 mins. is long enough for doing only 6 ? I can’t wait to make these ! I made 8 biscuits but will make 6 next time. If you make six, they will be slightly bigger so you may need to cook them 24 mins. Just check them after 22 mins. My friend made them the other day and she told me she made six instead of 8 and she tripled the batch and her family ate every single one. Hi Donna, yes you do grease the muffin pan like the directions say to. What kind of butter do u use? The original recipe (Paula Deen and Sons) used melted butter which makes it easier to incorporate with the flour without over mixing the two before adding the sour cream. These are so light and buttery no need to grease the pan with the amount of butter in the ingredients. After taking them out of the oven they just fall out with no problem. My husband loves these especially when I use a mini muffin pan so he can eat one or two without feeling guilty. If you don’t have time to make traditional biscuits, these are the perfect substitute. Thanks for the little tip Jeanette! Made these tonight for dinner. OMG they are delicious! Doubled the recipe so we’d have extra in the morning for breakfast but I don’t think they are going to last that long! Hi Melanie! I completely agree about these being delicious! So glad you enjoyed them. Thank you for leaving a comment. 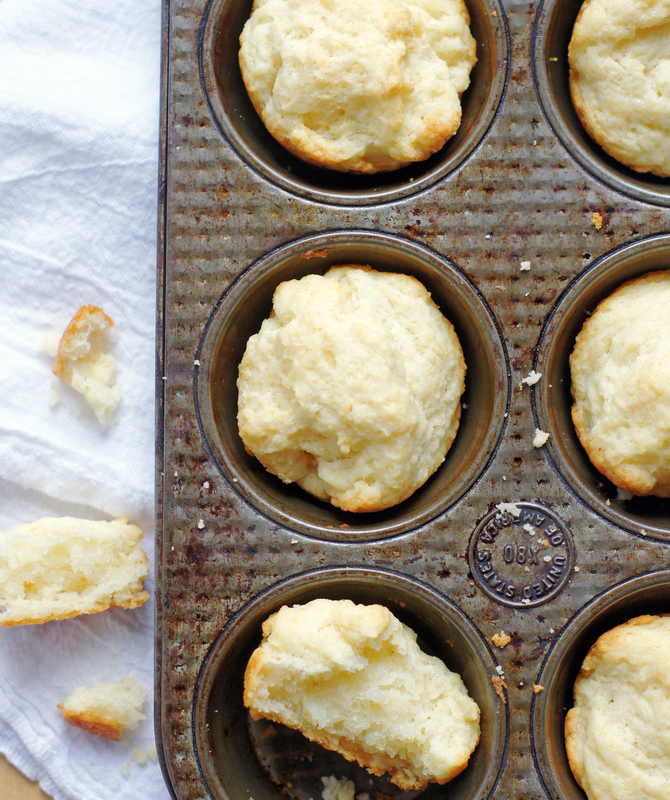 Can you make them like drop biscuits without the muffin pan? You certainly can try it, I’m sure they’d be just fine. They may flatten out a little more since the muffin pan helps them maintain their shape. I LOVE this recipe! I’ve made them twice now and the second time I added 3/4 cup of shredded cheddar cheese to the dough to make cheesy biscuits. They were a big hit! Thanks for the simple recipe. My wife loved them. I added two tablespoons of sugar to my dough, they taste great with honey and jam. So happy you loved them. Thanks for letting me know. I’ll have to try them with the sugar added. I tried these tonight as drop biscuits on my left over roast from lunch. I don’t think I will go back to regular biscuits! So good! So happy to hear you love these Kimberly. Thanks for leaving a comment. Just made these ! My husband said they were about the best texture in s biscuit he’s ever tasted ! Only thing I’d suggest is to add salted butter to the recipe bc we used unsalted and they were a little bland but the texture was amazing! Will definitely make again but try with salted butter . So easy too! Hi Melkel! I’m so happy you guys loved these biscuits. I do use salted butter, in them and I don’t think the recipe says to use unsalted. Did you just use unsalted because that’s what you had? Thanks for letting me know they were a hit! I made your sour cream biscuitsts this morning !! 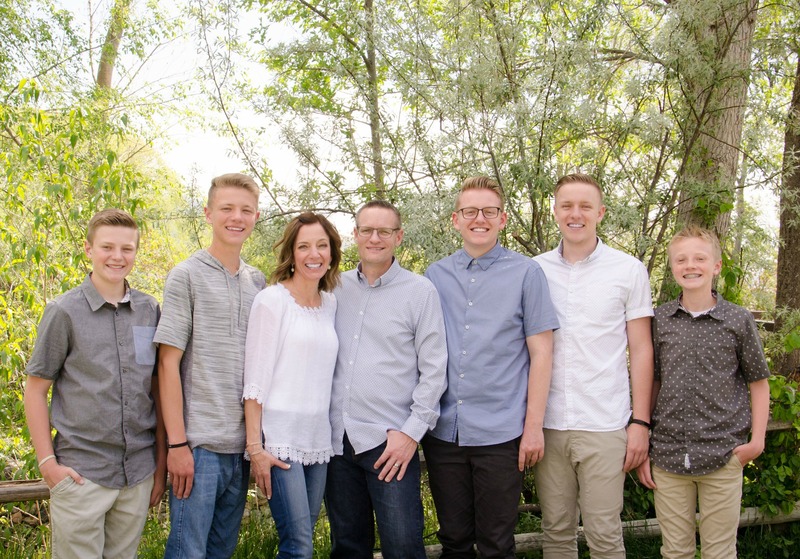 They are amazing. Thanks so much Melissa for letting me know. I couldn’t honestly eat the entire batch. They just kinda melt in your mouth, don’t they. Thanks for taking the time to leave a comment. Do they freeze well, and do you recommend them for strawberry shortcake? Hi Miriam. I have never frozen these, so I couldn’t tell you how they freeze. I’ve also never used them for strawberry shortcake, but these biscuits are so amazing, I’m sure strawberries and whipped cream on top would be delicious. Let me know if you give it a try. Just tried these and holy moly. SO good. Why would anybody waste time with another recipe after this one? Quick, no mess, and taste incredible. Thank you for my new go-to! Yay, I’m so glad you loved these. I agree, they’re so simple and delicious. Thanks Ashlynn, great to hear from you.